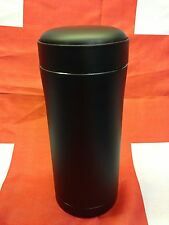 Army PLCE Ammo Pouch Matt Black Thermal Mug /Military Thermos Drinks Flask NEW (#221154301055) £7.99 View Item. This Strong & Robust Thermal Insulated Flask / Mug is Perfect when you are out and about and want to tahe a hot drink, soup or even stew etc! NO Bladder included in sale. Includes instructions to assemble your PLCE the right way! Patterning on photos is as per original manual. Must have for collector/reenactor. 1000D MTP Match Cordura. JSP 535 Cadet Instructor Red Book Cover. Using MoD specification materials we created a basic cover that will not only take a Cadet Instructor Red book but also has room for a pen. GENUINE ISSUE. PLCE Webbing belt. UNISSUED. Unissued but with a little bit of chipping on the paint on the Buckle. Perfect for Cadets or a reenactor or just a regular work belt. • Made from 1000d MTP fabric. • Colour - MTP (Multi-Terrain Pattern). • 2 double ammo pouches with velcro & press stud closing. • Roll pin buckle. MTP/MULTICAM 4 POUCH AIRBORNE WEBBING. MOLLE COMPATIBLE. 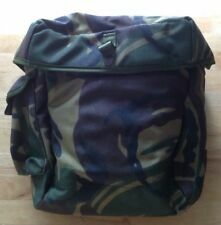 FRONT/SIDE MOLLE PANELS (FRONT W/VELCRO FINISH). 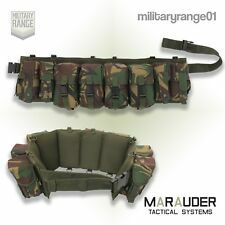 Viper Modular Side Pouch. REMOVABLE WEBBING SHOULDER CARRY STRAP. 3 X VIPER FIRM DRAW ZIP PULLERS. RUBBER LOGO PATCH. • Made from 1000d MTP fabric. • Colour - MTP (Multi-Terrain Pattern). 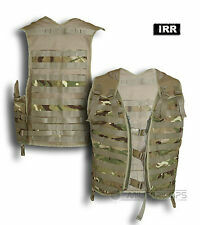 • Based on the popular Tactical Assault Vest. • 3 x 25mm quick-release buckles to fasten vest at front. on one side and pocket with lanyard loop on other side for spare mags. PLCE SAS PARA AIRBORNE WEBBING INFANTRY MULTICAM MTP STYLE CAMO SPECIAL FORCES. 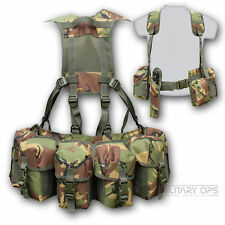 MOLLE PARA AIRBORNE SPECIAL FORCES WEBBING DPM CAMO MODULAR SAS SOLIDER. Special Forces Airborne Yoke • For use with the Special Forces Airborne Webbing, MOLLE Belt. Special Forces Airborne Belt and Platform Webbing Systems. • Wider at shoulders than normal standard issue yoke. Viper compact First Aid Kit constructed from hardwearing 600D V-Cam Cordura (which is fully MTP compatible). Contents include Non-adherent dressing, 6 x assorted safety pins, Waterproof dressing strip, 2 x alcohol-free wipes, bandage, antiseptic cream, crepe bandage and scissors. MTP/MULTICAM 3 POUCH AIRBORNE WEBBING. ALPHA TACTICAL AIRBORNE PLCE WEBBING SYSTEM. 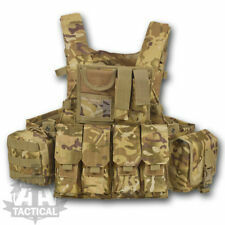 MOLLE PARA AIRBORNE SPECIAL FORCES WEBBING MULTICAM MTP CAMO MODULAR SAS SOLIDER. Has large label on back with designation, NSN #, manufacturer (Irvin, who make parachutes), and date stamp. ALPHA TACTICAL AIRBORNE PLCE WEBBING SYSTEM SAND. 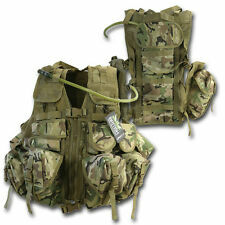 MLCE OSPREY MOLLE ASSAULT VEST MULTICAM MTP. Encourage the thoughts and dreams of children. Children are the masters of fantasy. These clothes and accessories make wonderful gifts for the outdoor loving child. Robust Adventure clothing, made to a very high standard, from a military products supplier, for Robust Imaginative Children. • Made from 1000d MTP fabric. • Colour - MTP (Multi-Terrain Pattern). Special Forces Airborne Yoke • For use with the Special Forces Airborne Webbing, MOLLE Belt. Special Forces Airborne Belt and Platform Webbing Systems. MOLLE COMPATIBLE. FRONT/SIDE MOLLE PANELS (FRONT W/VELCRO FINISH). 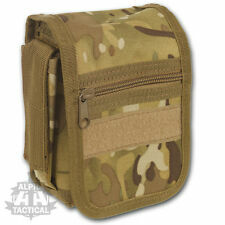 Viper Modular Side Pouch. REMOVABLE WEBBING SHOULDER CARRY STRAP. 3 X VIPER FIRM DRAW ZIP PULLERS. 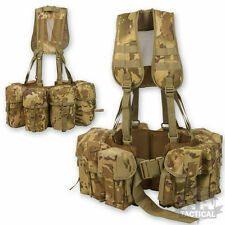 SECTION COMMANDERS ASSAULT VEST MULTICAM MTP. ALPHA TACTICAL AIRBORNE PLCE WEBBING SYSTEM BLACK. SALE is for Both. could be connected together to make a larger strap. 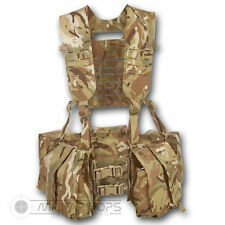 MTP MULTICAM CHEST RIG BRITISH ARMY STYLE. • Colour - DESERT. • 2 double ammo pouches with velcro & press stud closing.